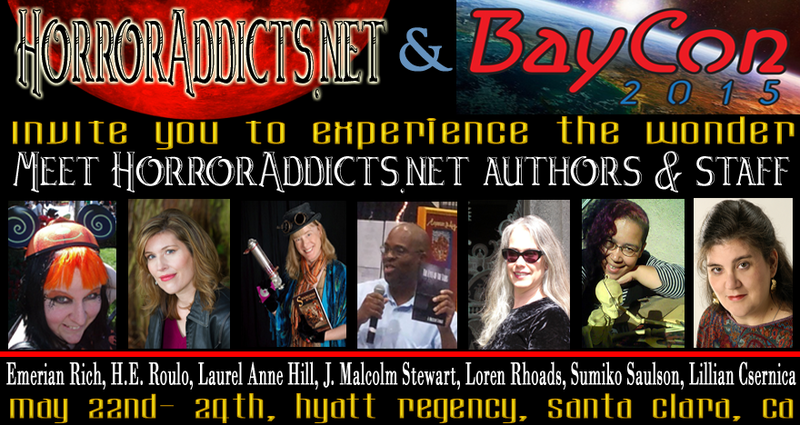 HorrorAddicts.net will be attending BayCon, the Science Fiction, Fantasy, and Horror Writer’s Convention in the San Francisco Bay Area. Join us at the Imagination Fair. Take selfies with Inkjet, the incredible cepholopod, chat with authors, get freebies, enjoy face painting, and answer trivia questions to get awesome swag from CometTV, like Tank Girl T-shirts, The Craft protection sachets, and alien gifts. Authors present will be: Laurel Anne Hill, Sumiko Saulson, J. Malcolm Stewart, Loren Rhoads, Emerian Rich, Mercy Hollow, E.M. Markoff, Trinity Adler, and more! This is a free event with swag to spare! HorrorAddicts.net: Come discuss musical influence on horror and dark fantasy literature, movies, and lifestyle. Hear authors read their horror stories and enter to win door prizes. Musically inspired horror favors free until they run out! Join us at BayCon 2016! Favors, door prizes, autographs, readings! Come to the Horror Addicts Guide to Life book release party! Freebies at the door and door prizes to boot! Plus, don’t miss getting all these signatures on your very own copy of the book.